Thomas Jefferson conceived the University of Virginia between 1814 and 1826 as a village, a self-contained unit with a total population of approximately 400. 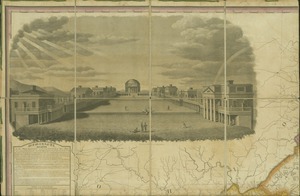 The Academical Village provided housing for students along the Lawn’s colonnades and the Range’s arcades, classrooms and living spaces for professors in the pavilions, dining halls in the hotels, and a library under the Rotunda’s dome. 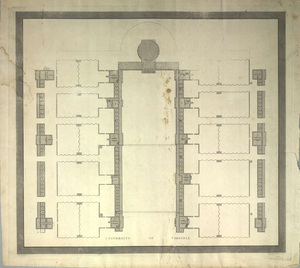 He not only designed the complex, but also chose the institution’s professors, curriculum, and even the library books. The University’s architecture uniquely represented the essential ideals of Jefferson’s educational and political philosophies and served as an integral part of the students’ education. How to build onto Jefferson’s masterpiece has proved a significant challenge as the University has grown from its first class of 123 students in 1825 to its present population of over 20,000. The original Academical Village has been amended and re-appropriated, new buildings have been constructed and subsequently repurposed, and the entire University has been repeatedly reorganized. As the village has expanded into sprawling grounds, Jefferson’s influence has fluctuated. The aesthetic of the historic core has often closely guided new construction, although more modern approaches have sometimes pushed tradition aside.